Thanksgiving is almost here! 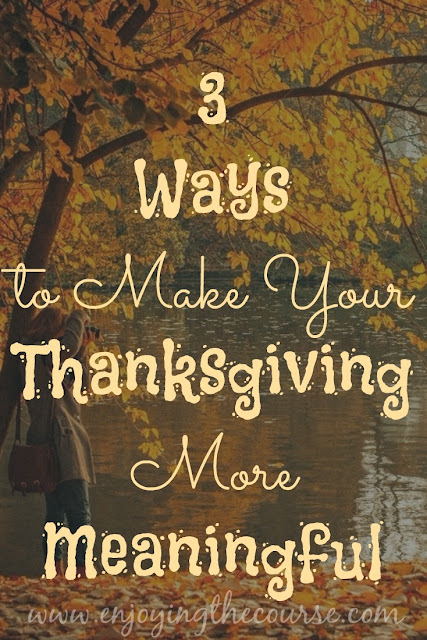 I thought I'd share some ideas to mix up your Thanksgiving Day celebrations and make the day a little more meaningful. I love this idea! One of my favorite Thanksgiving memories is from 2008 when we attempted this with my siblings and nieces and nephews. We didn't actually end up taking any pictures that year, but it was fun to slip into the cold November day and walk and talk while a few people finished the final touches on dinner. Just taking a walk is great, but consider pausing during the walk to capture the beauty of late fall (or early winter, depending on the weather where you live) and/or some candid moments of the day. The simple act of snapping a photo can elicit feelings of gratitude, plus the addition of some exercise also increases endorphins and helps you feel a little happier and more grateful. When your Thanksgiving guests ask what they can bring to dinner, tell them to bring a Thanksgiving-themed story. It could be a story they make up or an experience from real life. You could keep it general or provide a more specific theme - either way, it's a great way to involve all your guests in the festivities because everyone would get a chance to share something. I've never actually been to a storytelling party, but it could be fun because as one of the shy people at a party, it would help me feel more comfortable having a story ready to go. Plus it would be fun to hear a lot of stories I might not otherwise hear. Running a Thanksgiving Day Race. Devote a mile, or interval, to something you are thankful for this year. Or maybe create a playlist that reminds you of the things for which you are thankful. If you're running the race with friends, take turns telling each other why you're thankful. Even if you're not running a race, you could incorporate these ideas into a regular run on Thanksgiving while the turkey is cooking. 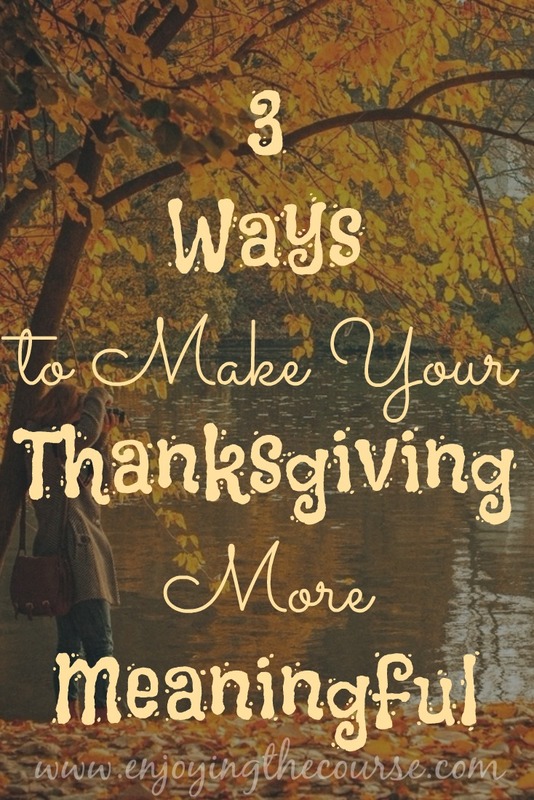 These are just 3 ideas to help make your Thanksgiving a little more meaningful. How do you make the holiday more meaningful? Girl! You better get on that. Lol!! I won't be doing the race I normally do as I am not 100% right now, but I will have my own personal morning workout. Yeah. You gotta take it easy and let your foot heal. :0 But enjoy your workout! I like the idea of the photo walk! The leaves are finally so vibrant here! Ooh! I hope they stay that way for Thanksgiving. A photo walk is so fun. Isn't it a fun idea? We all have some great stories to tell. This year I think we are going to my brother's house. He hasn't invited us yet. :-) In the morning I will be running a turkey trot.